For proper analysis of your vehicle you need to conduct structural analysis of your cage for side, roll, front, rear & torsional impacts. The primary aim in your analysis should be to reduce weight of the vehicle and to test for failure.The un-sprung weight, rotating mass and roll cage are primary weight reduction areas and you should try to reduce the weight of your car to 300 kg with higher stiffness of the roll cage to help your car achieve the highest acceleration while maintaining a sufficient factor of safety. The driver comfort and sturdiness of the vehicle is considered of primary importance. 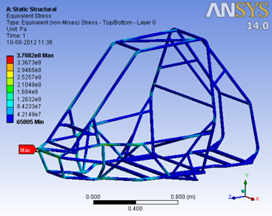 For weight reduction of the cage, You can test a number of cage types having different pipe thicknesses in ANSYS Mechanical with various types of impacts and then evaluated the maximum stress. The final cage is selected by considering the resulting stresses & applying a suitable factor of safety. 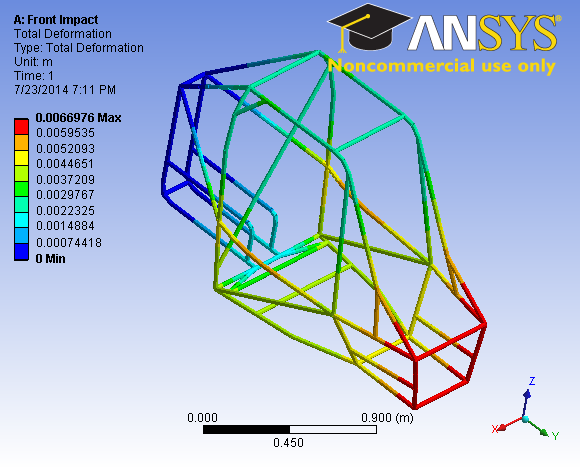 Mail us if you need further detailed helps and tutorials on ANSYS for BAJA-SAE Competitions.